I promised myself that as long as have my Julep Maven subscription active, I won't buy another polish ever again. But I can't help an amazing deal! I've been trying to look for a Tiffany's blue polish for quite some time and I was a little bit let down when I realized Julep Robin wasn't as close as I had hoped. 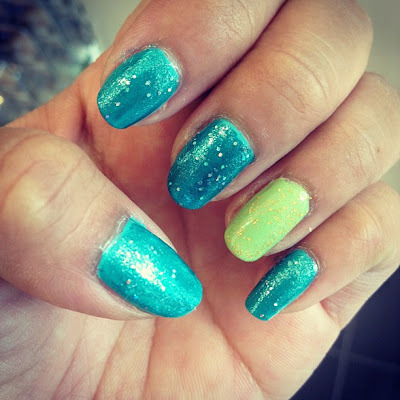 I read a blog post a long time ago that did an in-depth analysis of "Tiffany Blue" polishes. The conclusion was that Essie's Turquoise and Caicos was one of the best matches. You should check out the post, it's actually really interesting. Anyways, I went to TBBS to browse. The store is on Bay Street and Dundas Street in Toronto and it's one of the best places to get nail polishes. While Shoppers Drug Mart charges $11.99 for an Essie Polish, it is only $6.95 at TBBS. You can find some Essie polishes on sale for $3.99! I ended up succumbing to the beauty of Essie's Turquoise and Caicos and made the purchase. I guess it's time for another Tiffany's nail art. Obviously it's going to be totally different from my last two attempts! I have a jewelry themed Konad plate that I haven't used yet! Also, I didn't realize it until now but Turquoise and Caicos has the same initials as Tiffany and Co. (T & C), do you think it's planned? Must be! wow a forty dollar top coat? I would definitely pass on that! however it is a novel idea! very nice choice of colours!! Ooh, this is so pretty!! wow this looks awesome! good call on perusing through sehora for a top coat. I would have definitely put a $40 top coat on my nails if I saw it!! Thank you for your comment! hahah- I see that the colors you said you love are the colors you use on your nails! So sparkly! this set of nail colors would have gone great with my recent post! Darn my lack of nail creation creativity. I especially like the nails in the upper left corner of your header! So cute! I am totally your newest follower now! Hope you follow me if you like my bloggie. I look forward to more sparkly posts! gorgeous colors! I seriously love to do one nail a different color, it's my favorite!